The chinchilla has a head and body length of 9 to 14 inches with a 3 to 6 inch tail. Females are larger than males weighing 1.5 to 2 pounds, while males rarely exceed 1 pound. They have extremely dense, soft, silky fur which may grow to 1.5 inches long. They may have as many as 40 hairs growing from one follicle. Color is pearly or brown-grey with black tips on the upper parts. They have conspicuously long whiskers with which they can feel their way in dark tunnels. 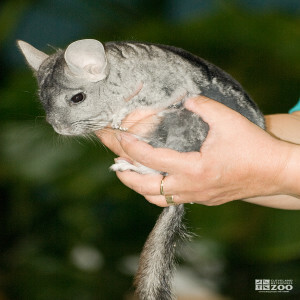 Chinchillas are endangered in the wild because of the fur trade. It requires a minimum of 140 pelts to make one coat. Historically their range was 1200 to1800 feet in the Andes. Now chinchillas are confined to northern Chile. Chinchillas inhabit rocky barren areas; usually barren, arid, rugged areas of mountain chain of the Andes. Gestation in chinchillas is about 111 days. Chinchillas have litters of about 1 to 6 young. Chinchillas are primarily nocturnal or crepuscular, but can be found climbing and jumping among the rocks on a sunny day. Colonies of up to 100 live together, often on north-facing slopes. Several pairs may share a den. They shelter in rocks and crevices or at the base of spiny plants. Fur is kept clean by rolling in sand or volcanic dust and then shaking it out. They sit on their haunches and hold food to eat in the front paws. Moisture is obtained from plant material and dew. Female chinchillas are very aggressive toward each other and towards males, even in estrus. Their estrus cycle is approximately 38 days. In captive populations in the northern hemisphere, breeding season is November to May and in the southern hemisphere it is from May to November. Newborns are fully furred with eyes open at birth, and they nurse for 6 to 8 weeks. Sexual maturity occurs at 6 months for females and 8 months for males. A chinchilla's diet includes grass, nuts, leaves, roots, and lichens. Their diet in the zoo includes guinea pig pellets, fruits, and vegetables.